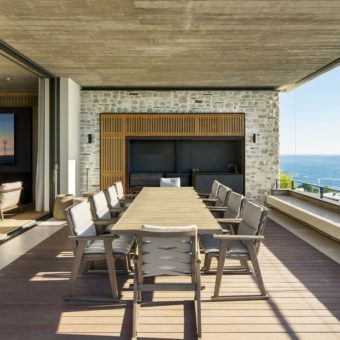 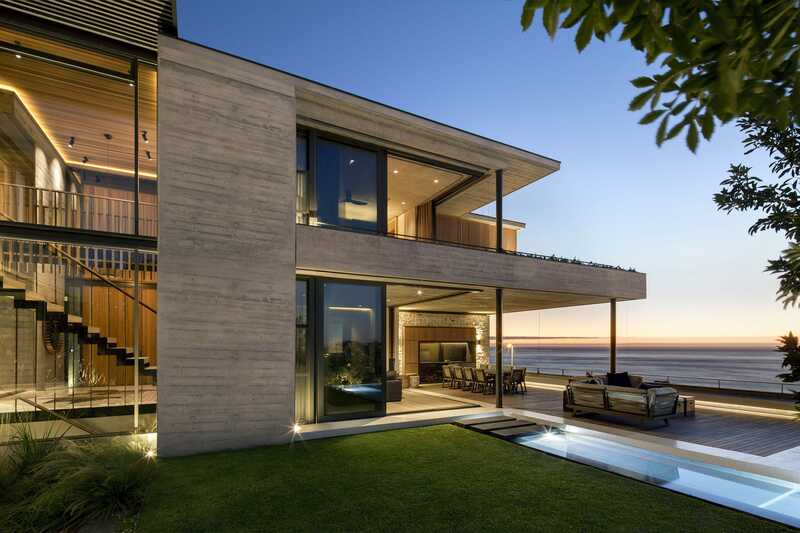 The suburb of Clifton on Cape Town’s Atlantic Seaboard has a high rate of foot traffic due to it’s scenic beauty, with residents and tourists being keen joggers and walkers. 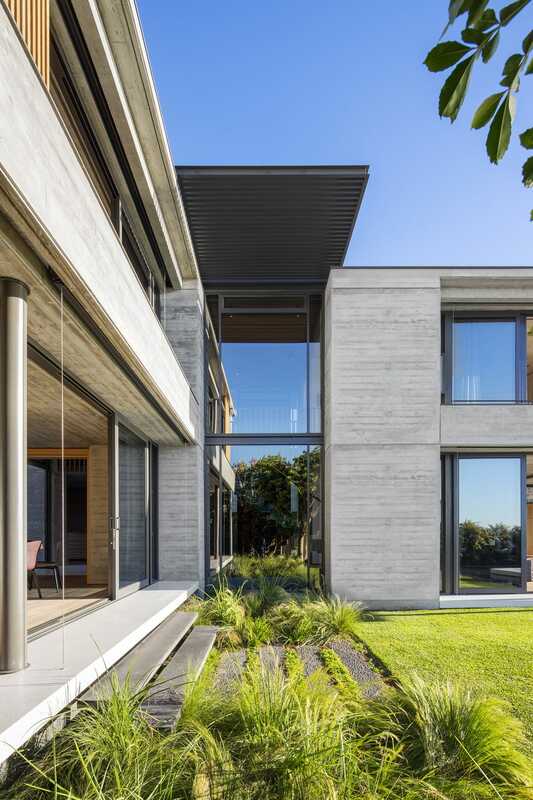 It was a deliberate design intention to take this fact into consideration – in a neighborhood characterized by high blank boundary walls and overpowering building mass. 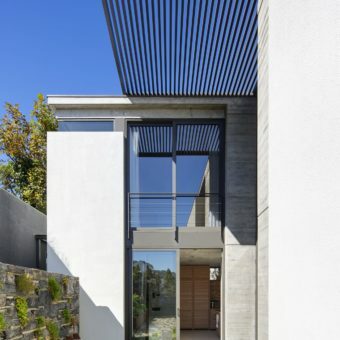 The house is visually accessible from the street, rather than hiding behind perimeter walls and gates – and it aims to contribute to the streetscape (specific attention has been paid to landscaping design at sidewalk level), in relation to the sidewalks and to the height of existing adjacent houses. 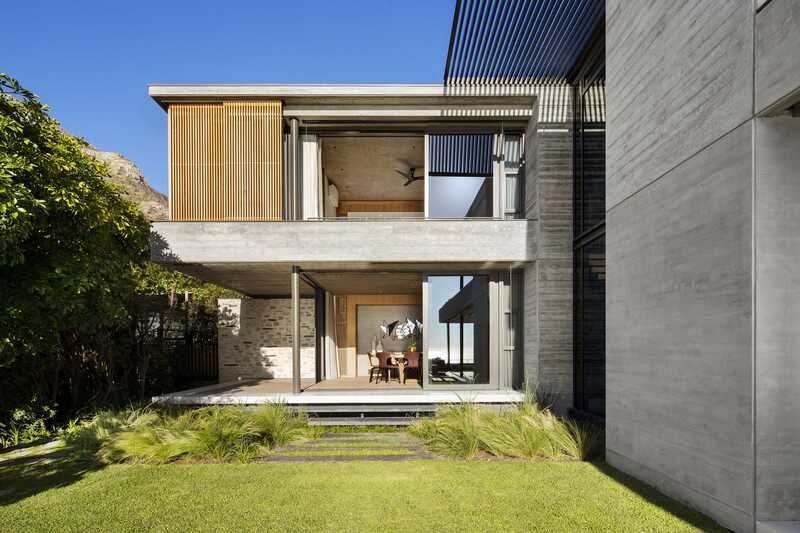 It occupies a position on the hill side between lower lying houses to the left or north, and higher situated properties to the right or south of it. 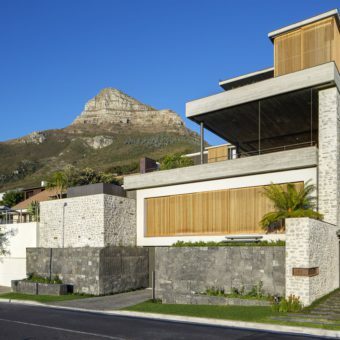 Gabion walls are used to elevate the living spaces, de-emphasize a large garage and screen utilities. 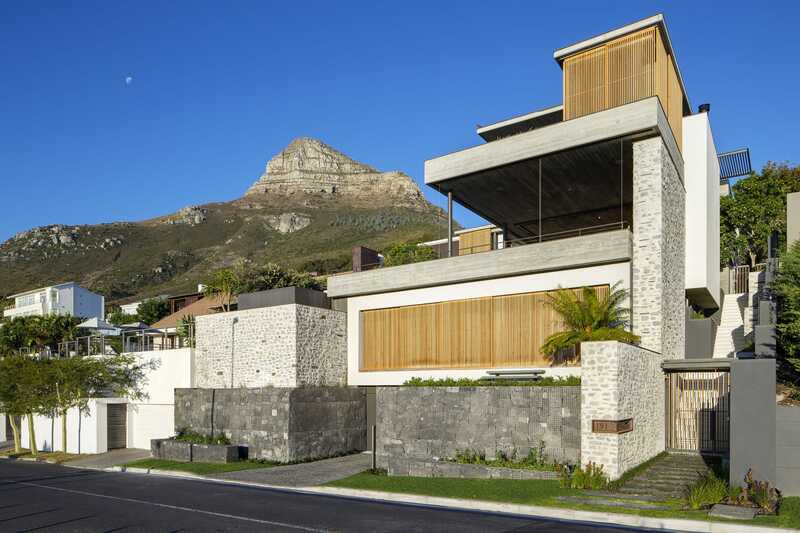 Elevation above road level is essential to maximize view potential, but can lead to overpowering building mass. 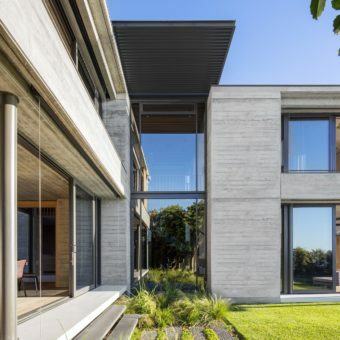 The design therefor aims to erode the building mass by means of smaller volumes and expressing thinner structural elements such as floor slabs, thereby creating an organic stacking of building components. 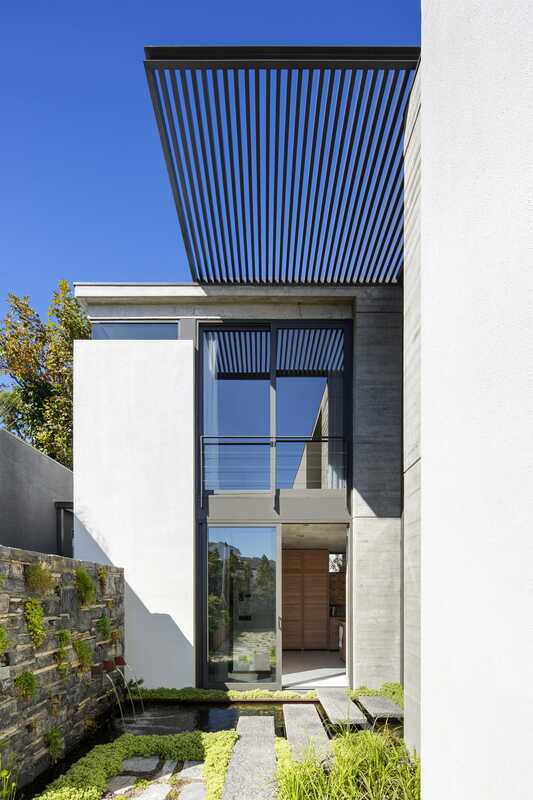 The garage’s gabion walls have been planted to become overgrown with time, and as such soften the streetscape for passers-by. 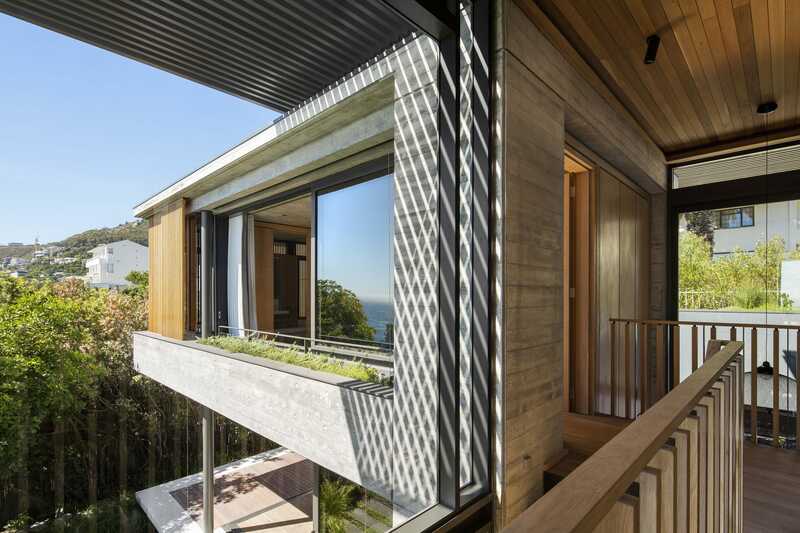 The guest flat on first floor has full views over the road, to the sea beyond, and is given privacy by means of a cedar wood shuttered wall. 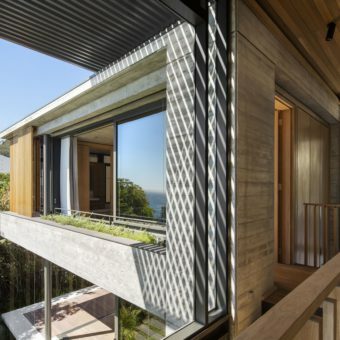 The lower two levels (garage and guest apartment) of the home engage more with the hillside, whereas the top two levels, housing the main residence, become boulder-like objects perched on the hillside. 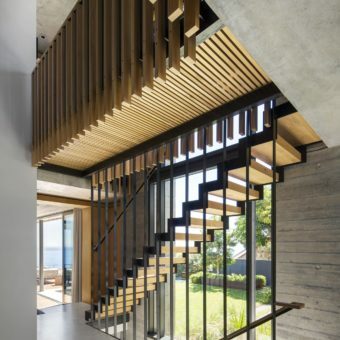 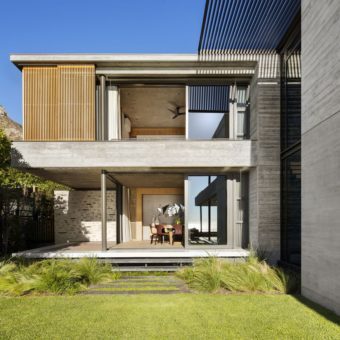 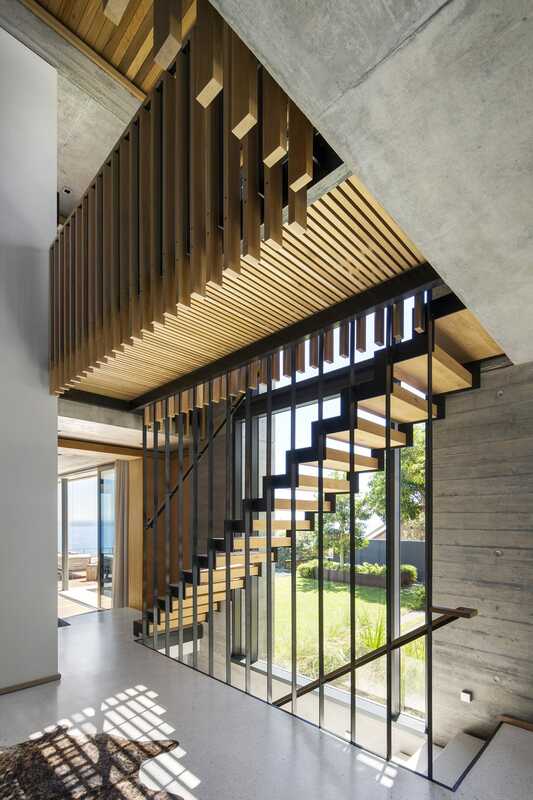 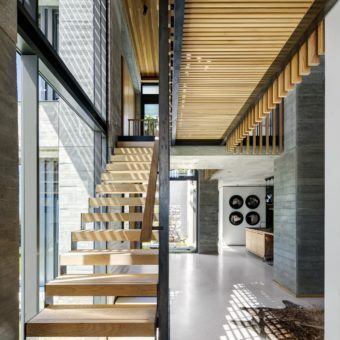 The main residence is broken into three off-shutter concrete building blocks (the ‘boulders’), connected by means of a free-flowing double volume atrium space, also containing vertical circulation (staircase and lift). 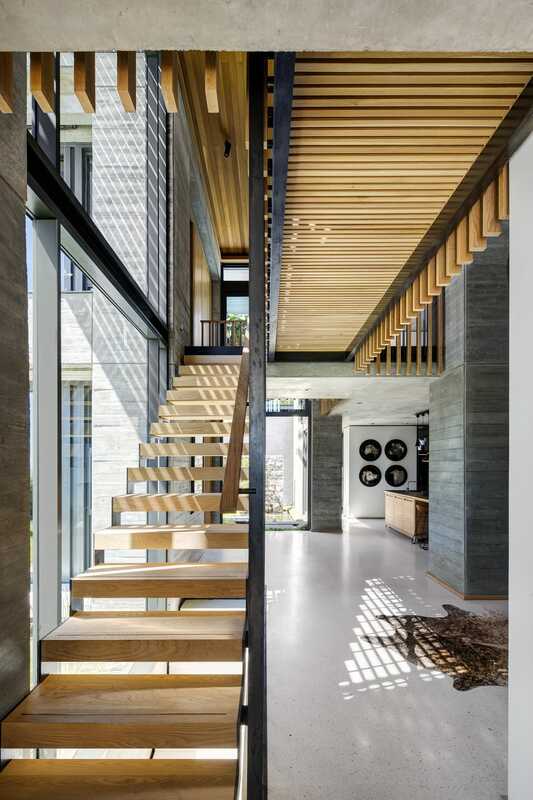 Two ‘bookends’ of the residence is expressed as glazed and cedar shuttered boxes, housing bathrooms that become lit-from-within lanterns at night. 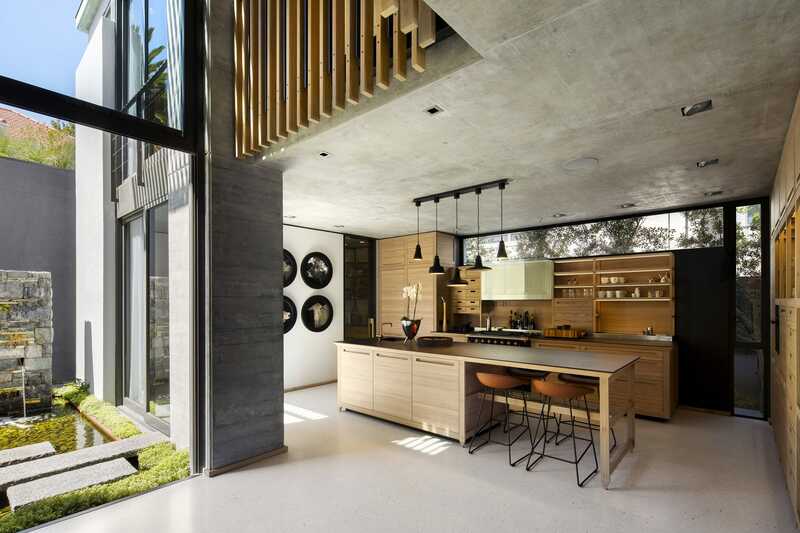 These elements are further celebrated by being cantilevered over negative space below. 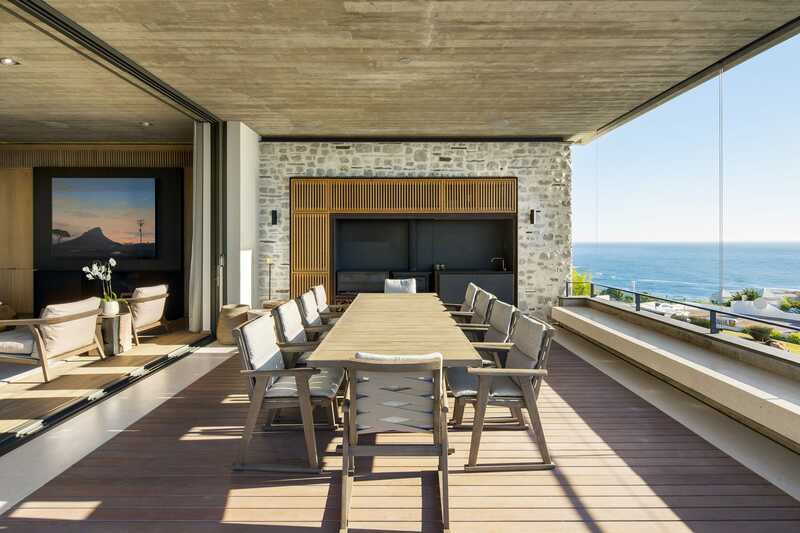 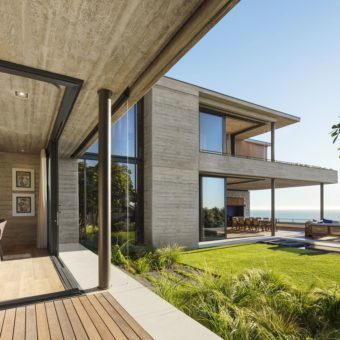 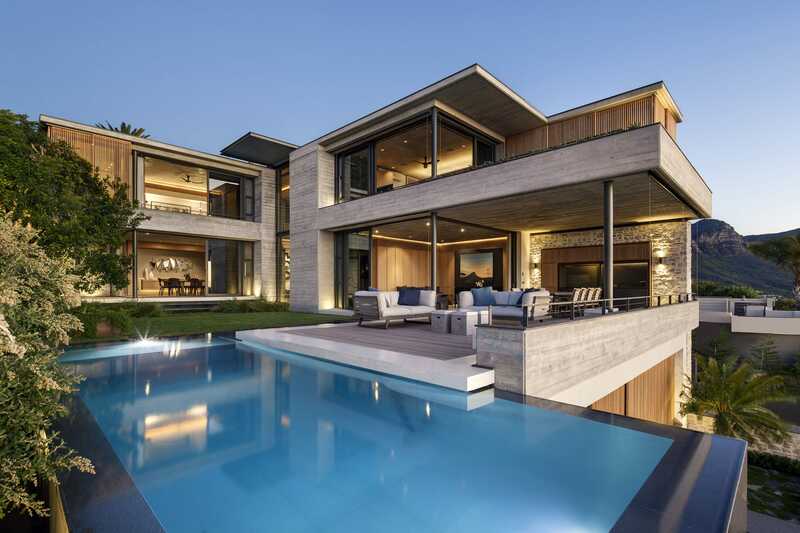 Seamless indoor-outdoor living spaces spill out onto a comfortable protected and landscaped courtyard, that allows maximum north exposure, rather than responding to sea views only. 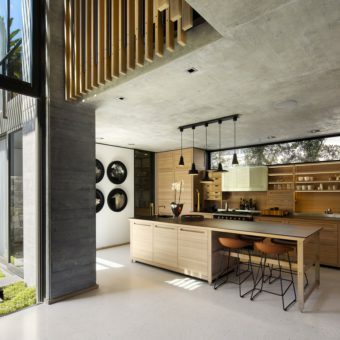 Similarly the kitchen has a direct connection to the vegetable and herb garden by means of stepping-stones over a pond with a wet wall water feature. 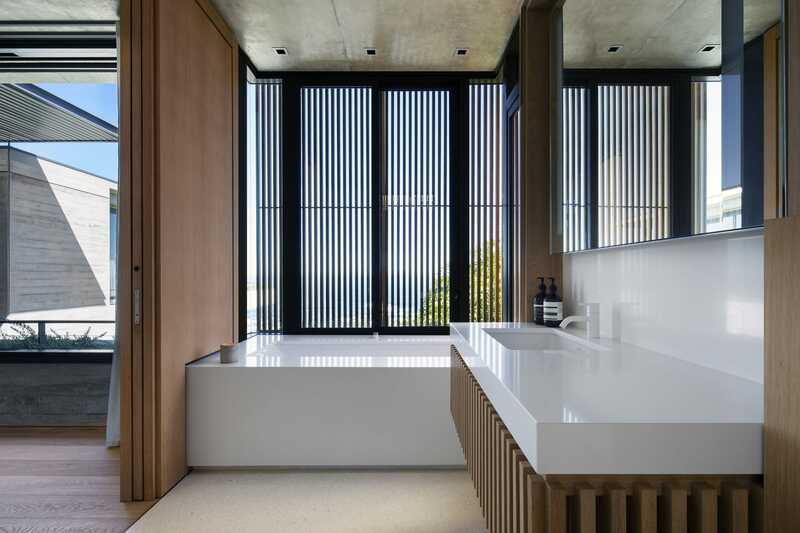 The atrium opens up to the pond by means of a story-high mechanical sash window, greatly adding to natural cooling in the summer. 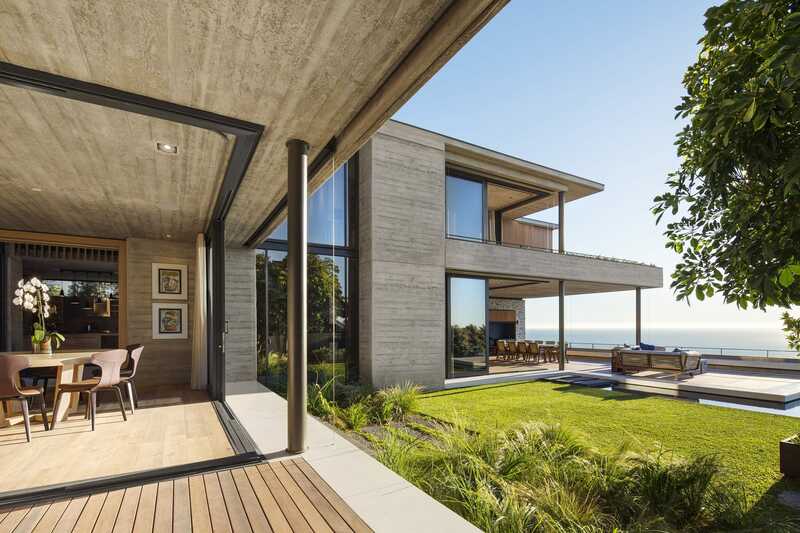 Roof over-hangs and glazing specifications were carefully considered in order to minimize unwanted solar heat gain. 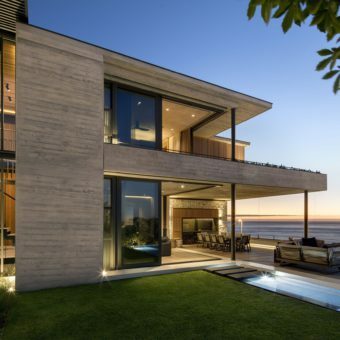 Western exposure is regulated with external, automated drop-down screens over glazed façades, whilst energy consumption is minimized by means of Photovoltaic and Solar panels both linked to a centralized system for domestic water heating, waterborne under-floor and pool heating. 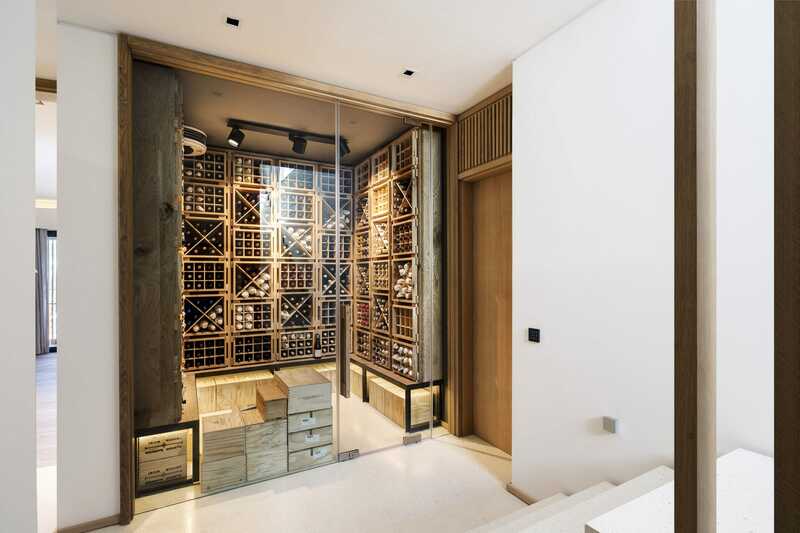 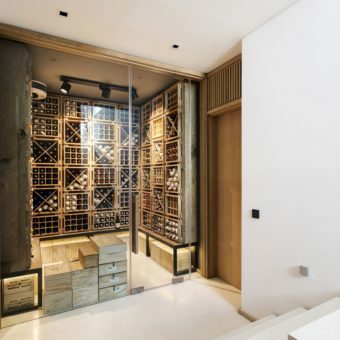 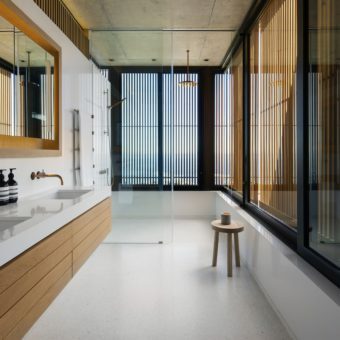 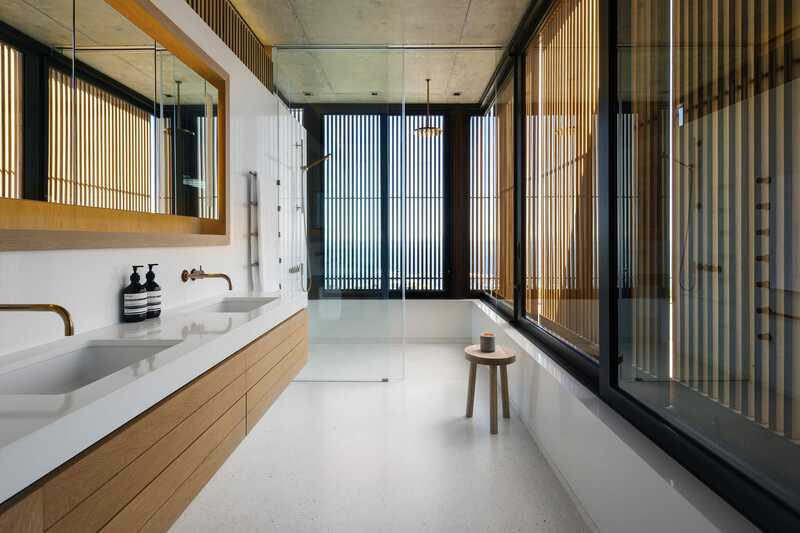 The selection of materials; board-marked concrete, local stone, untreated cedar wood, rough-sawn oak floor planks, terrazzo floors and Corten steel will express the passing of time, with the gradual changing of each material’s natural colour and texture.